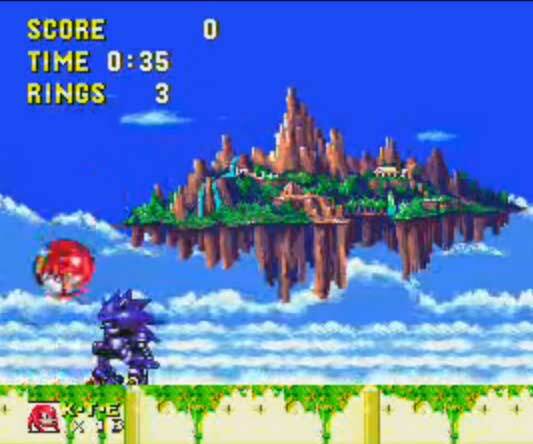 The Mecha or Silver Sonic Boss is a recurring enemy in the Sonic the Hedgehog series since the Master System version of the second part (1992) of the long running series. The boss was originally named Mecha Sonic but English Manuals referred to him as Silver Sonic, This name was later used for him in the Sonic the Hedgehog Archie comics as well. The character saw multiple redesigns and returned in Sonic & Knuckles, Sonic the Hedgehog Pocket Adventure and also in even smaller roles in Sonic The Fighters and Sonic Adventure. Since Sonic CD, it is more or less replaced with Metal Sonic. Mecha / Silver Sonic is a robotic version of Sonic the Hedgehog, developed by Doctor Robotnik and Eggman to beat the original. The Mecha Sonic from Sonic & Knuckles was drawn as part of the Game-Art-HQ Villains Challenge in December 2014.